It was the worst fire since the 1906 earthquake, but that's not what made the Levin Tannery's destruction a disaster. The ferocity of the blaze that afternoon in the early summer of 1910 was astonishing. "Great masses of heavy, black smoke rolled high into the heavens, solid walls of red and angry flame leaped in every direction," according to the Press Democrat, "explosion followed explosion as oil tanks and acid receptacles were reached, and the hissing of escaping steam from the great boilers added to the unearthly din." 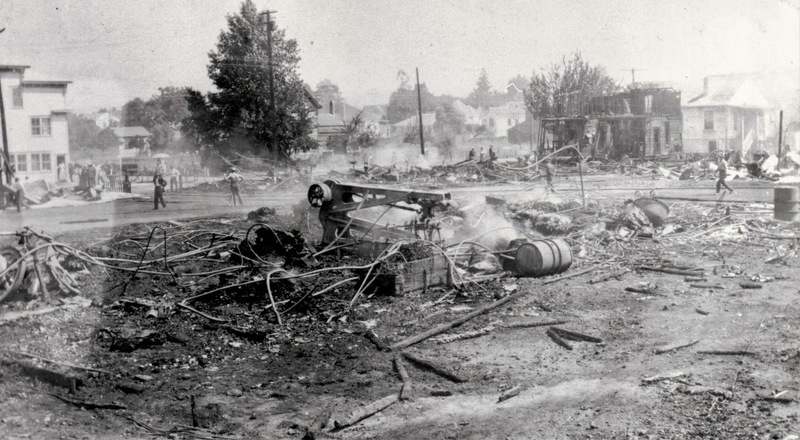 The fire, at the modern location of 101 Brookwood Avenue, immediately spread from the tannery to the adjacent shoe factory and a couple of houses. And then it was remembered that gasoline was being stored at the building next door. "It was said there was enough gasoline in the place had it exploded, to have wrecked every building within a considerable distance, to say nothing of the probable loss of life," the PD reported. 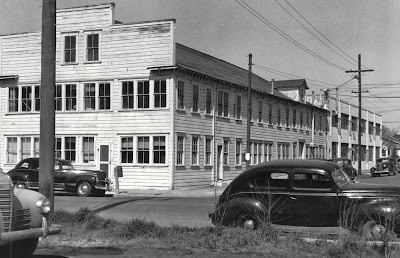 Soon afterwards the Santa Rosa Chamber of Commerce held the first of three public meetings on the future of the tannery and shoe factory, the events chaired by Press Democrat publisher Ernest Finley wearing his hat as the Chamber's president. Curiously, no members of the Levin family or representatives from the owners attended. Some prominent businessmen said they had discussed matters with the Levin brothers, and while hastening to add they were not speaking on the Levin's behalf, were in fact clearly doing so. At the first meeting, one of the non-spokesman spokesmen for the Levins stated "plans are already well under way for the immediate re-establishment of the Tannery, but had intimated that if any suitable arrangement should be proposed they might be willing to move to some other part of town, as they were tired of having to fight with their neighbors and carry on business at the same time." Dr. Bogle suggested the tannery could be rebuilt near the train depot, which sounds similar to the 1908 proposal that Santa Rosa move all the bordellos to the West End Italian neighborhood. At the next meeting three days later, Finley presented a proposal from the Levins. It was a complicated deal. The shoe factory would be spun off into a separate business after $75,000 was raised by selling shares in the new corporation. Half of the investment would come from the Levins, with local capitalists chipping in the rest. The factory would stay at the same location, with the rest of the land to be sold to the new company for $10,000. The tannery would move - once Santa Rosa found a new suitable location for them. It was never explained whether the city or the Levins would own the property at the new spot. It was quite the sweetheart deal for the Levins, who apparently had enough insurance coverage to rebuild both businesses anyway. They would net the equivalent of about $5 million today while hanging on to half ownership in the factory. And presumably, the new location for the tannery would come with a city guarantee there would be no further complaints made against them. The third meeting recapped the proposals and State Senator Walter F. Price reported that investors were really getting excited; they had raised about 20 percent of the funds in just the past 72 hours. Oh, and it had been privately decided it was important for the city to buy the former tannery land for a public park. And thus two weeks later, everything was riding on the City Council approving $5,000 (the investor's half of the property deal with the Levins paying themselves the other half). And the Council said no. "The City has no money for such purposes," a councilman told the Press Democrat. At a special meeting of the City Council called for last evening to consider the park proposition upon which also hinged the re-establishment of the shoe factory, the removal of the Levin Tanning Company's plant from the residence district, its early re-establishment here in another part of town, and the ending of the long and bitter wrangle that has resulted from the maintainence of the tannery at its present location, the entire project was turned down, and with scant ceremony. In addition to that remarkable sentence which dribbles on for nearly seven dozen words, the PD article closed by naming all members of the Council who were at that meeting. At least he didn't publish their home addresses and announce the hardware store was having a sale on rope. That was the end of the tannery removal saga. The Levins began to rebuild the shoe factory and tannery in the exact same locations. Five weeks after the Council refused to appropriate funds, two people sued the Levins, claiming the tannery conditions were damaging their health. There are two takeaways to the story. First, it's highly unlikely the tannery actually could have been relocated elsewhere in Santa Rosa. Tanneries use lots of water and thus need to be near a plentiful supply, such as Santa Rosa Creek, and it's doubtful there was another creekside location available in city limits - Santa Rosa was so small at the time you could probably bicycle from any end of town to the other within ten minutes. If they left their old location it would make more sense for the Levins to leave Santa Rosa altogether and rebuild somewhere like Petaluma, which already had a large tannery on the river. The story also shows Santa Rosa's leaders once again managing to find a way to fail in a win-win situation. This was a pattern during the first decade of the Twentieth Century, as has been discussed here several times. Grand proposals were made for the betterment of the town, only to collapse because there was no political will to follow through, no courage to take risks no matter how good the cause and how eagerly sought the outcome. The Levin Tannery was long recognized as a blight on the town, its bad practices destroying the creek and causing endless complaints about the smell. It does not take a genius to see that its presence seriously hampered the town's growth. Yet at the second public meeting, the PD reported, "From the first, [Ernest Finley] said, the only object had been to prevent anything being done that might run the tannery out of town and lose its payroll to the city." More than anyone else, über-booster Finley should have championed letting the tannery leave for the sake of Santa Rosa's future, even if it meant the loss of a few jobs. It has to be understood, too, that the tannery drama was playing out at the exact same time as the courtroom case over the downtown lake. As described in the previous item, a group of citizens banded together and created a little lake by damming Santa Rosa Creek. Admired by all for creating a much sought-after park, it was doomed first by the toxic discharges into the creek during the tannery fire, then threatened by a lawsuit from a man who claimed his property line extended into the middle of the creek. But like the tannery situation, there were no better angels in Santa Rosa to step up and do what was best. Even though the District Attorney was part of the grassroots effort, the city averted its gaze and allowed the dam to be demolished. For reasons unrelated to the ersatz lake, Santa Rosa had reasons to challenge such a claim - it was important to settle legally whether half of the creek was private property or not. The lake story and the tannery relocation tale ended up being twin failures for the town, the two episodes joined together like the front and back sides of the same plugged nickel. Which was about all Santa Rosa's leadership was worth. *The population of the greater Santa Rosa area in 1910 was around 11,000 (see discussion) which would make 4,000 a reasonable guess as to the number of total able-bodied men in the workforce. Fire dealt Santa Rosa another hard blow yesterday afternoon, leaving in its wake a mass of smouldering ruins to mark the spot on upper Second street where the big plant of the Levin Tanning Company and the Santa Rosa Shoe Manufacturing plant had stood. Within an hour from the time the alarm was turned in, so fiercely did the fire rage, that damage amounting to more than $150,000 had been wrought, and two of the city's largest and most important institutions wiped out. About ten minutes past five o'clock the alarm sounded, and it took but a glance in the direction indicated by the box number to show that a fire of startling proportions had broken out. Before the fire department could reach the scene, the highly inflammable nature of the main tannery building and its contents, accelerated by a stiff breeze blowing from the southwest, had given the flames such a mastery of the situation that it was apparent the big building as well as the one beside it, was doomed. It was one of the most spectacular fires ever seen here. Great masses of heavy, black smoke rolled high into the heavens, solid walls of red and angry flame leaped in every direction, explosion followed explosion as oil tanks and acid receptacles were reached, and the hissing of escaping steam from the great boilers added to the unearthly din. The fire started in the main tannery building, which was located right on the creek bank, and at the worst possible point, as far as controlling the flames was concerned. The wind drove the flames directly on and into the big structure, leaping higher and higher in their angry revel, crackling and roaring their defiance. Leaping across the narrow passageway between the main tannery building and the four-story finishing house, they rushed on toward the street and the office building and dwellings standing opposite. From the first it was seen that the big shoe factory to the east was doomed, and when the long arms of flame reached out and took it in, a fresh touch of the spectacular was lent to the scene already boarding on the tragic. In and out of the many windows the angry flames played and when the wind drove them clear across the street. Just when it seemed that the warehouse and office building must likewise become their prey, the wind again veered and drove the flames back over the already half-demolished factory building. With the tannery building, finishing house and shoe factory, much valuable machinery and large number of tools, as well as immense quantities of leather and shoe stock, were consumed. The cottage occupied by Mr. and Mrs. Frank Day and owned by Mrs. Anne E. Straub, was completely gutted. The Days succeeded in removing considerable of the furniture, but as they held no insurance the loss is quite heavy. This cottage adjoined the tannery on the west. On the east side of the shoe factory the residence owned by John Brennard and occupied by the Misses Anna and Maria Brennard, was also burned. The occupants saved some of their belongings. The magnitude of the fire occasioned much excitement in the neighborhood and people on both sides of the street in proximity to the burning buildings carried out most of their furniture. Many roofs were wetted down and a number of smaller blazes started by the flying embers were extinguished without much damage resulting. The residence of Milton Wasserman on upper Third street caught on fire several times, but the flames were fortunately extinguished without any serious damage being done. A grass fire was also started near the residence of John Rinner, but was speedily stamped out when discovered. The greatest excitement prevailed when it was known that almost in the path of the flames was an old planing mill, in which was stored a large quantity of gasoline belonging to the company represented here by A. D. Sund as local agent. It was said there was enough gasoline in the place had it exploded, to have wrecked every building within a considerable distance, to say nothing of the probable loss of life. Very fortunately the fire did not take the building. Ben Noonan, in his big Stoddard-Dayton touring car, did valiant and effective service during the fire. When the blaze was assuming dangerous proportions, he raced to the fire station on Fifth street, hitched the auxiliary steamer on to his machine and in on time had it at the scene of action. Again he raced back for a load of fire hose, and again he went back for a fresh supply of coal for both steamers. At one o'clock this morning he drove past the Press Democrat office, pulling the auxiliary engine back to the engine house, for it was not until that hour that the engines were removed. Hosemen were on duty all night, guarding against any possibility of further outbreak of fire. The origin on the fire is not known. It broke out soon after the men had quit work for the night, and before they had all left the premises. Two men still working in the finishing house were compelled to flee in their working clothes. Fortunately the plants were well insured, and it is likely the insurance will practically cover the loss. Both institutions were doing a great business at the time, and the fire necessarily hinders that, and at the same time throws many people out of employment. About 140 men were employed at the time of the fire. ...Under the head of new business, Chairman Finley stated that the special order of business for the evening was the consideration of tannery matters, briefly outlining the situation resulting from the recent destruction of the Levin company's big plants, and stating that a free and full discussion of the matter was desired. J. H. Einhorn started the ball rolling by stating that everybody wanted to see the Tannery and Shoe Factory reestablished, because they had been a good thing for the town. The business community could not fail to notice the loss of the company's big payroll, he said. M. Rosenberg stated that he had had a talk with Nate and Pincus Levin, in which they both had told him that plans are already well under way for the immediate re-establishment of the Tannery, but had intimated that if any suitable arrangement should be proposed they might be willing to move to some other part of town, as they were tired of having to fight with their neighbors and carry on business at the same time. He said the Levins had further told him that while the Shoe Factory was on a paying basis at the time of the fire, they had not yet made up their minds whether to rebuild it or not. If the community would assist them, however, they would rebuild, and furnish half the capital required. The amount necessary to properly build and equip the Shoe Factory was estimated at between $60,000 and $75,000. Charles E. Lee said he thought the community could well afford to assist in the establishment of such institutions, and favored as many citizens taking stock as possible. J. H. Brush said the business community fully appreciated the work that had been done by the two institutions, and wanted to know whether in the event of being asked to take stock it would be in a joint tannery and shoe factory, or merely in a shoe factory operated as a separate concern. Mr. Rosenberg said that as he understood it, the Shoe Factory and Tannery were separate and distinct institutions. C. D. Barnett said that he had had a talk with the Levins, and while he had no authority to make any statement in their behalf, he understood that they felt that would have their hands full for a while with the Tannery alone, and that if they started the Shoe Factory they would want to put all the details of supervision and management in the hands of a competent manager. On some such basis they would be willing to furnish half the capital required. ...Dr. S. S. Bogle told of the plan undertaken last year to secure a tract of land near the depot for factory sites, and hoped something could still be done along that line. "Now is the time to settle this matter of location," he said. He said he would be willing to give $100 toward procuring a new site, and thought the people living in the neighborhood of the old plant would all assist to the best of their ability. At the mass meeting held under the auspices of the Chamber of Commerce Monday evening at the Columbia theatre, the committee named at Friday night's meeting to formulate a plan of action in the Shoe Factory and Tannery matter submitted its report. The report was adopted, and the committee authorized to proceed and try and work the plan out to a successful conclusion, additional members being added to assist in handing the details. Briefly stated, the plan proposed is to have a corporation capitalized at $75,000, of which amount the citizens will be asked to subscribe half and the Levin Tanning Company the remainder, said corporation to take over the business of the Santa Rosa Shoe Manufacturing Company and begin operations at as early a date as possible. The Levin Tanning Company agrees to sell to the Shoe Company all [illegible microfilm] at the head of Second street and move its tanning plant to another part of the city for $10,000. Monday night's mass meeting under the auspices of the Chamber of Commerce was called to order by President Ernest L. Finley, who acted as chairman. Secretary Edward Brown kept the minutes. The meeting was held in the Columbia theatre, the use of which had been tendered by Manager Ray Crone of the Columbia Amusement Company. In stating the objects of the meeting, Chairman Finley took occasion to refer to criticisms that had been heard when the Chamber of Commerce took up the tannery matter, stating he believed it was the result of a misunderstanding as to the aims and purpose of the organization. From the first, he said, the only object had been to prevent anything being done that might run the tannery out of town and lose its payroll to the city. ...John Rinner called attention to the fact that if the tannery is re-established on its old site, the city will be compelled to expend five or six thousand dollars on a new sewer to accommodate the street sewage, while if the tannery is moved the present sewer will do. This he mentioned as an additional argument in favor of having the city co-operate in the plan now under way to bring about the tannery's removal. At a special meeting of the City Council called for last evening to consider the park proposition upon which also hinged the re-establishment of the shoe factory, the removal of the Levin Tanning Company's plant from the residence district, its early re-establishment here in another part of town, and the ending of the long and bitter wrangle that has resulted from the maintenance of the tannery at its present location, the entire project was turned down, and with scant ceremony. "We declined to endorse the plan -- the City has no money for such purposes," said a member of the Council to a Press Democrat representative after the meeting was over. The plan as outlined was presented by the Chamber of Commerce, which organization had previously given the project much careful consideration and its unqualified support...The Women's Improvement Club had promised to donate the sum of $2,500 toward the plan and also to assist the project in other ways. The residents living in the immediate vicinity of the Levin plant had promised $5,000 to help carry the plan to a successful conclusion. The City was asked to assist to the extend of $5,000, said sum to be paid at any time it might prove convenient, half out of one year's levy and half out of the next year's if desired. In return, it had been arranged to have the Levin Tanning Company deed all its holdings at the head of Second street to the City for park purposes. Present at last night's meeting were Mayor James R. Edwards, Councilmen C. Fred Forgett, H. L Johstone, Fred C. Steiner, Eugene Bronson and Frank L. Blanchard. Alleging that she has been damaged in the sum of $2,500 by reason of conditions existing at the tannery that have depreciated the value of her property, and been a menace to her health, Mrs. Catherine Bower has instituted a suit for the recovery of damages and for an injunction against the Levin Tanning Company. In her prayer the plaintiff asks for a judgment of this court that defendant be forever restrained and enjoined from maintaining, conducting, operating or carrying on a tannery upon the site mentioned, the manufacturing of leather from hides, the handling of hides, the allowing of deleterious matter to enter Santa Rosa Creek and many other things constituting as alleged by Mrs. Bower in her complaint a nuisance. The injunction asked for is a permanent one. For some time the injunction proceedings have been threatened.